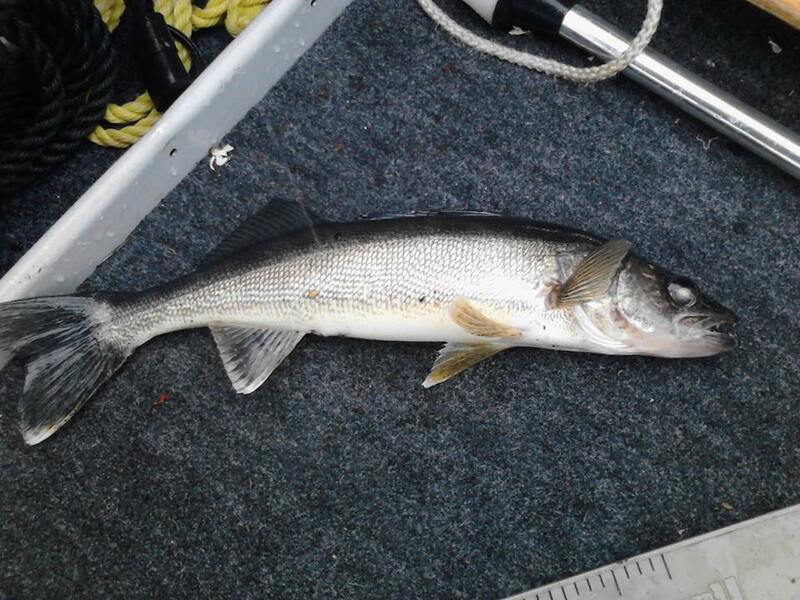 I have been hearing for the last 2 years about the walleyes in the Salmon River Reservoir. I have tried a few times with out luck to locate them. I was starting to wonder if it was true as I had yet to see one caught from there until today. My friend Mike and I headed to Redfield this morning in search of walleyes. We found lots of large Rock bass, one 12 inch perch, and one 16 inch walleye. I caught the walleye fishing a bucktail jig tipped with a worm in about 20 feet of water. Yesterday was the first time I have fished with buck tail jigs using stinger hooks. Until yesterday I had never even heard of such a thing. I use trailer hooks on spinner baits but had never thought of using them on a jig. The stinger hooks we where using where small treble hooks rigged on mono-filament fishing line. The line is run through a bobber stop then looped and brought back through the stop creating a loop to put over the jig hook. A metal crimp is used below the bobber stop to keep the loop together. You tip the jig with half a night crawler, loop the stinger hook over the jig hook, and then slide the bobber stop up tight to the hook. This technique is great when a fish strikes the worm and not the jig itself. The walleye I caught yesterday came in hooked just by the stinger. My friend Mike said that many times this is the case. Only when the bite is really on do they normally come in on the main hook. He fishes a stinger hook whenever he is Walleye fishing on Oneida Lake. After yesterday I am a believer and will be doing the same. Spring had come early. The early spring brought on some excellent Brown Trout fishing in the end of March and it continued through the month of April. Now it was May and water levels were lower than they should be for that time of year. I had a guide trip booked for opening night at midnight and was worried. I spent the day time rigging rods and shopping at Gander Mountain. I was worried with the low water I would need some different lures to put fish in the boat. I purchased multiple small jigs and smaller stick baits. Now that the boat was all set it was time to take a nap until 8 pm. As I drove to the river I kept going over my game plan in my head. I was very nervous as I had never fished this river at this level before. As always I wanted to put my clients on good fish. They had called me because they normally fish for Walleye on Onieda Lake and wanted to catch bigger fish then what they are use to. I had told them I could put them on 6 pound plus fish and I was determined to do so. I had asked them to meet me at 11 pm so we could get in the water in case there were other boats fishing that night. I arrived at the launch around 10 and there was no one there. I launched the drift boat and put all the gear in the boat. My clients arrived a little before 11 and there was still no one else there. We talked about fishing and hunting as we waited for legal fishing time. The season didn’t open until midnight. They had plans of Turkey hunting in the morning after we finished fishing and joked about being done in time to take a nap before hunting. Finally it was quarter to twelve and we got in the boat. I rowed us out into the river and anchored up where we would start fishing. I then explained how the reels worked and what my plans were. At 12 am I had them put the lures out and pulled anchor. I started up the middle section of the river where I knew the water would be the deepest. It wasn’t long before the left rod doubled over… FISH ON!!!. I dropped anchor and netted a nice 5 pound Walleye as he brought it to the boat. We put the lures back out, pulled anchor, and started up the river again. It wasn’t more than a few minutes and I was yelling left rod left rod again. This time we brought a Walleye in the 6 pound range to the net. Time to change the lure on the right rod. I put the same Rapala on it that was on the right rod. Normally I would run different lures but it was obvious tonight that was the lure the Walleye wanted. We started pulling the plugs again in that same fast deep section and it was game on. At 2:30 am we put the 6th Walleye in the fish box. They had hooked 8 fish landed 7. One was not big enough to keep. In just two and half hours they had limited out with 6 fish all in the 5 to 7 pound range. They were very happy with the trip and had time to get back to camp for a nap before Turkey hunting. Turns out there was no reason for me to be worried about this trip. I should have known that the low water was just going to stack all the fish in the one deep area on the river and they would want the same lures they always do. To this day I still have not used that tackle I bought.